Driving around the Old Las Palmas neighborhood I was surprised at the number of For Sale signs, often four or more on one side of a block. I knew that California had been one of the areas most badly affected by the housing crisis but I hadn't realised how hard the state had been hit. 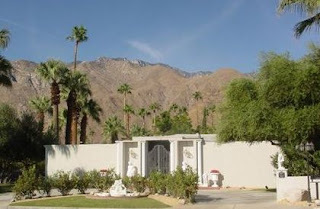 Even in the more tony neighborhoods of Palm Springs, you could feel the pressure to sell - at any price. And the homes ranged in every condition from mint to almost abandoned; foreclosure signs placed despondently among the cactus and yuccas. 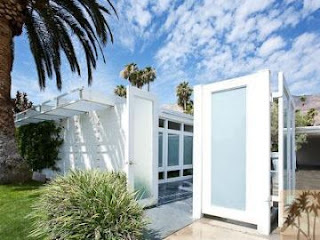 Donald Wexler designed this house for Dinah Shore in 1963. It's a glorious example of a Hollywood home in the desert that has been stunningly and sympathetically renovated. 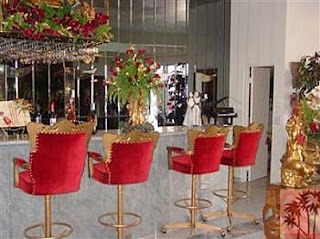 Listed at almost $6,000,000, double the price it sold for in 2003, it has been on the market since Spring. 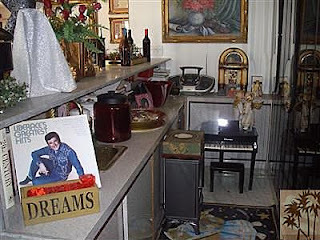 A secret gem: One of Elvis' desert homes, owned by Liberace until 1971.
and the occasional piece of Liberace memorabilia. Also on the market, for $1,295,000, is the former Tony Curtis/Janet Leigh home "Camp Curtis", a stunning 1960 Fey home that got smacked with a nasty granite kitchen in a recent remodel. Click here for more details/photos. love the pics and the insider info-- you convinced me to buy them all. Great tour. Thanks for all great the links. But I think I'll do without the flock, the glitz and Papa John. oh dear...that granite kitchen is a travesty!!! Aren't the mountains stunning? I kind of like a couple of those houses, as well. Mama mia what a fabulous post! This is heaven and now my weekend read is complete. The Donald Wexler looks amazing! Have a wonderful weekend and thanks for all the links!